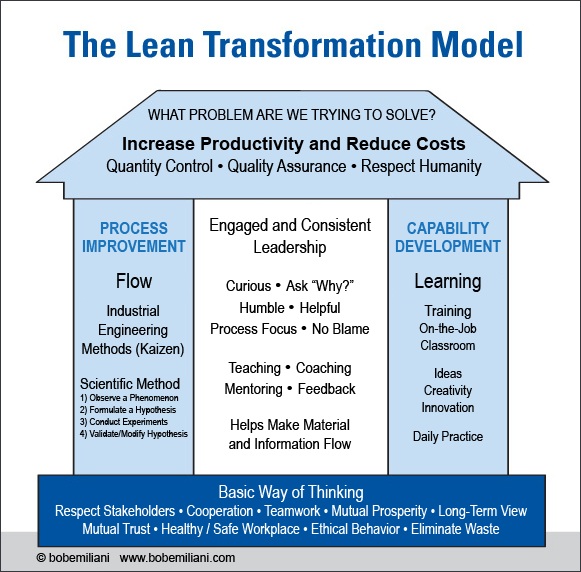 The Lean Enterprise Institute and the Lean Enterprise Academy have recently created a Lean transformation model that I like a lot because it is an accurate representation of how Toyota developed the Toyota Production System concurrently with The Toyota Way over many years. A big thank you to John Shook. The model is a good one for everyone to follow. But, being a professor and someone who likes to think and improve things, I thought it might help people to see the model with a greater level of detail – in part to make it more specific and actionable. The details that I have inserted are consistent with the history and evolution of Toyota, inclusive of management’s thinking and practice. I hope you find this to be a helpful compliment to the above image. It is very important to recognize that the “Basic Way of Thinking” is the foundation for success. Too many business leaders lack this “Basic Way of Thinking,” and, as a result, are unable to emulate Toyota in even the most simplistic of ways. Their Lean efforts fall far short of expectations and usually do harm to people. 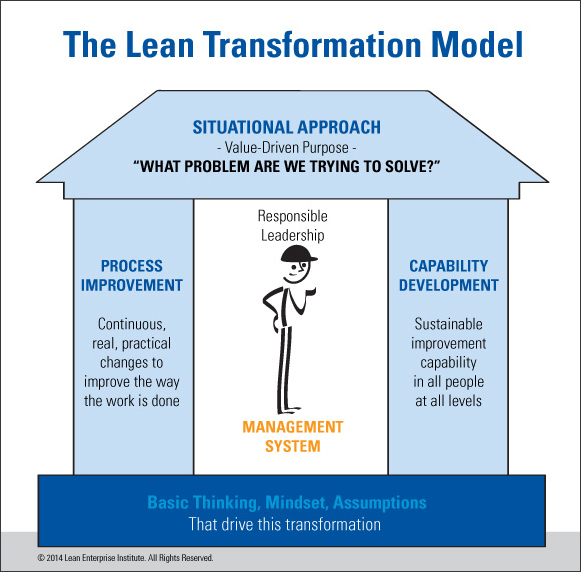 Effective Lean transformations must begin with many big changes in the “Basic Way of Thinking” for entire senior leadership teams. Great Kaizen of the existing model. I like your diagram and the specificity that it adds. Nice level of detail Bob, I love the breakdown. Would have preferred remove waste over reduce costs though. Hhmm – I’m still waiting for the emphasis on the service/customer experience and the successful outcomes they desire/expect. It’s not explicitly shown in this model, but customer experience and satisfying user’s desires is embedded processes such as quality function deployment. QFD identifies customer wants and needs based on the Kano model. Bob – thanks again – I’m gonna leave it here – I still feel the model is infrastructure centric – techie biased. The language has to speak to its audience of course, but even your suggestion to check out ‘Lean Product & Process Development’ triggers my inside-out indicators. I like your additions. All models have limitations, but this is a good one. Why do you have Quality Control / Quality Assurance / Respect Humanity at the top of your model? Would these not be part of the process or methods – in either increasing capability or process improvement. QC and QA help standardize the process, regardless of the situation or problem you are trying to solve. Respect for Humanity – seems to me it belong more in the ‘center’ – it is how you ideally go about both building capability and improving flow. Those parts of the model mirror the original explanation of TPS that came from Taiichi Ohno via Yasuhiro Monden in his 1983 book, Toyota Production System.